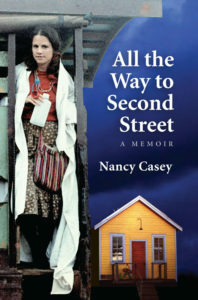 It’s 1980 and Nancy is 28 years old, the perfect Catholic girl, living in a suburb of Detroit, doing what she is told. Her life has been a series of academic honors, followed by a dress-for-success career, and marriage to a man that everyone loves. Yet she feels trapped and wants more. She moves out of her brick house and heads west. In Boulder, Colorado, she meets Robb, an artist and writer. They move to Idaho and join the back-to-the land movement. Her family condemns her. Her friends shake their heads. She vows to write down every detail so they will understand the importance of embracing radical simplicity and perhaps join her. This is a diary of survival skills and personal growth, an odyssey through the unexpected. Through the voice of Nancy’s journal and letters, we visit a little-examined period in Idaho history, when hippies were moving to the hills. We stay with her until she lands in a small house on Second Street, a single mother, in an Idaho town.